Is there a demo available for the S5 Trader? Is paper trading included in my demo? Yes, S5 Trader has a demo available here. Paper trading is included in the S5 Trader demo. Does the demo/live S5 Trader have real-time data? Does a demo/simulation environment of the S5 Trader come with a live account? Yes, an unlimited simulation environment is available with a live account as long as your account balance is $5,000 or more. If your balance is less than $5,000 please contact your broker for help with setting up a new Demo. I'd like to use a new trading platform, but I'm not 100% sure of how to use it. Can someone help me with that? Absolutely! Just fill out this form to get a platform walkthrough with a Stage 5 broker. How do I activate live trading? Once you have a live funded account the back office will activate it for live trading. This normally takes about one business day once the funds have cleared into your live trading account. Your Stage 5 broker or the client services team will notify you once your account is activated and ready for live trading. How do I recover lost login information? How do I change my S5 Trader Password? How do I place an order if my platform is down or I do not have access to it? During regular trading hours please call your Stage 5 Trading broker directly or contact the Stage 5 Trading Client Services team at +1.312-896-9897 or email us During the overnight session please call the 24 hour trade desk. +1-614-764-4499 or +1-800-920-5808 ext. 1 for both numbers. How do I fund my S5 Trader account? Due to anti-money laundering laws, Gain Capital, LLC can only accept funds coming from an account in the same name as your Gain/OEC account. For example, you cannot send funds from a personal bank account to a futures account in the name of an LLC, even if you own 100% of the LLC. Similarly, you cannot send funds to someone else’s futures account, and vice versa. You can, however, send funds from an individual account to a joint account that is open with the individual’s name on that joint account. Incoming wires in US$ must be received by 15:00 EST, for same day deposit. Gain Capital Group, LLC does not accept money orders, third party, or traveler’s checks. If you have any questions or concerns about this please contact your Stage 5 Trading broker directly, or contact the Stage 5 Trading Client Services team at +1.312-896-9897 or If you would like to fund an account other than the S5 Trader software account please contact your broker or client services. How do I open an account with Stage 5 using the S5 Trader? How can I follow Stage 5 on twitter? @S5T_Alerts – this is a client-only twitter which we can use to alert you to any sudden problems that may occur. @S5Trading – this is our public twitter account that anyone can follow. We recommend you follow both! How can I reset the password on my S5 Trade Analyzer? If you have any problems either area, email your broker at Stage 5. 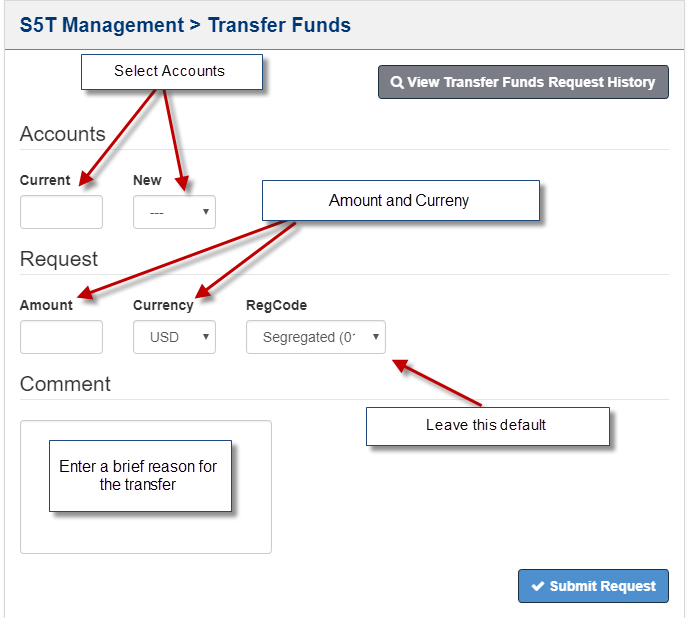 What is the cut off for outgoing wire transfers? The cut off for wire transfers is 10 AM US Central Time. Any requests for wires or checks after this time will result in the wire/check being sent out next day. I am a Canadian Resident – can I open an account at Stage 5 Trading? Yes! We have a clearing relationship that allows us to open Canadian accounts. What are my margin requirements? Stage 5 default margin requirements are set at 50% of the full initial margin for each particular contract. Different margins can be set on a case by case basis – if you are having a problem with margin email your broker at Stage 5. 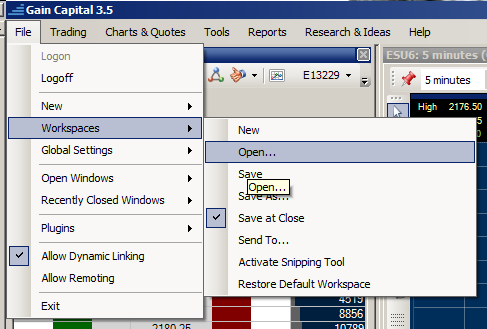 Options are also disabled by default but can be enabled by emailing your broker at Stage 5. Stage 5 has the ability to clear you through several different clearing firms depending on what your unique brokerage solution requires. Different clearing firms have differing starting requirements. Please reach out to us to discuss what the best solution is for you and to determine starting capital requirements. How long does it take to post the wire/check I sent to my account? Once checks are received, they are held for 5 days to clear. Gain processes wires in batches every several hours, so a wire sent early in the day may be posted that same day to the account. How long does it take a check to reach me? Check are sent via the US Postal Service. Checks may take anywhere from 5 days to 3 weeks to arrive. In our opinion, wires are safer and faster than checks. The S5 Trade Analyzer does not show one of my accounts, what do I do? Email your broker at Stage 5 to double check the backend of your S5 Trade Analyzer. How do I convert funds in my account? Email your broker at Stage. How do I access statements, change my password, manage market data, update my address, or any other personal information? All of this can be found in the S5 Trader Portal by logging in with your Live Account credentials (the same credentials you use to log into your platform). How can I download the S5 Trader Live and Demo? The best way would be to log into your S5 Trader Portal with either your live account username and password, or your demo account username and password (the same credentials you use to log into the platform). 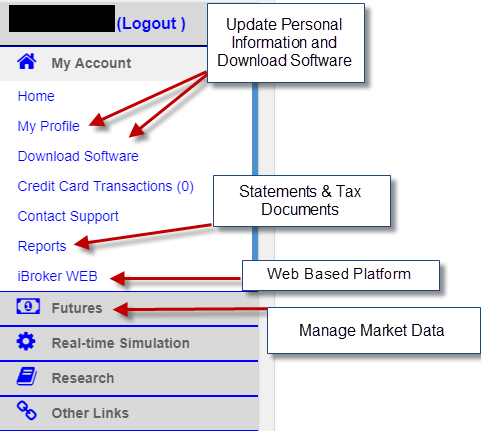 Once logged in, navigate to the “Download Software” section under, “My Account.” From here you will find links to download the latest version of both the live and demo version of the S5 Trader, along with being able to manually download any plug-ins if they are needed (they should be installed be default). How do I trade on mobile? You can download the “S5 Mobile” from the app store on both Android and iPhones. You log into the application with the same credentials you would use to log into your desk top platform. Contracts traded on mobile have a $0.25 fee per contract. If you log into the S5 Trader Portal with either your live or demo account credentials, you can also access the web-based platform, iBroker Web. How can I stop getting statements? We recommend receiving and reviewing account statements daily. We do not recommend stopping daily statements being sent to your email. If you find the daily statements bothersome, then we recommend creating a separate folder in your mailbox and then making a rule/filter to automatically send statements into that folder so they are handy if you need them. If you still want to stop statements entirely, then you can simply reply to one of the statement emails requesting that they no longer be sent. Statements can always be accessed from the S5 Trader Portal by logging in with your live account credentials (the same ones you use to access your platform). You can find your 1099 from your S5 Trader Portal. Please note that IRA’s do not receive 1099’s. Please see this FAQ to see how to access your statements. 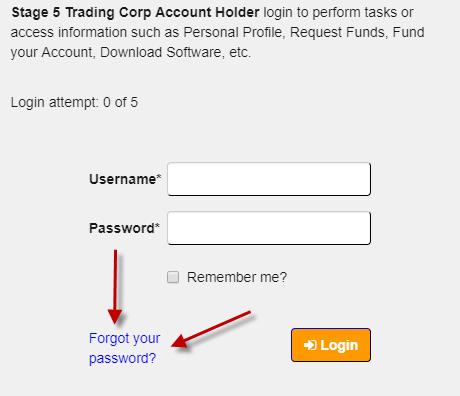 In general, there are two passwords that you may want to reset at Stage 5 Trading: Your live account password and your S5 Trade Analyzer password. If you have any problems with either area, email your broker at Stage 5. How can I transfer funds between my main account and my sub account? I have a live account, why is my demo expired? A live account at Stage 5 Trading that clears through Gain Capital provides a demo account that is attached to your live account. 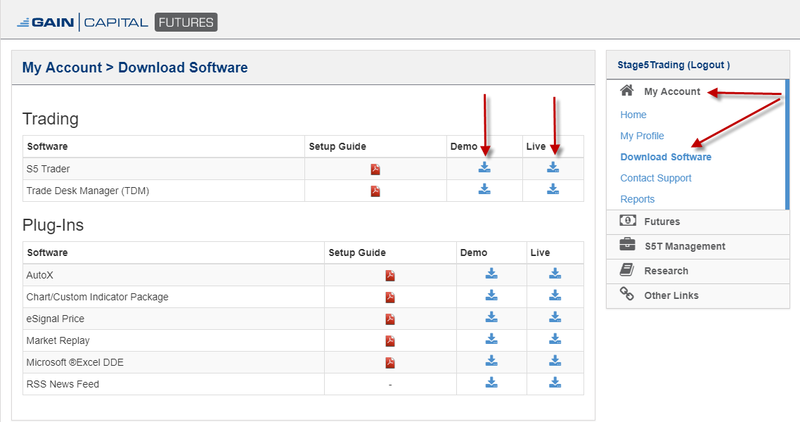 This demo account mirrors data and software enablement’s that are active on your live account. However, you must have a live account that has at least $5,000.00 in it for this demo to renew. If your demo expired, then it means your live account was under the $5,000.00 threshold when the demo account was up for renewal. If your account balance is over $5,000.00 now, either through trading or by adding more funds, email your broker at Stage 5 to have your demo with live account re-enabled. If you account balance is under $5,000.00 and require a demo, email your broker at Stage 5 to set you up with a temporary 30-day demo. Statements can be accessed from the portal listed below. If you do not have access to this area, email your broker at Stage 5. When will my funds be posted? Funds wired to your account should appear on your daily statement the evening they arrive. A wire sent that day should typically be available the next day for trading. Checks usually take 5 days to clear. How do I enable my platform and data feeds? Once your broker at Stage 5 sees reception of funds for your account, they should call and email you to confirm what platform and data feeds you need. Once your account is fully set up, they should contact you with your live account credentials. Any other questions or issues pertaining to Dorman Trading can be answered by emailing your broker at Stage 5 Trading. Statements for your Ironbeam account can be accessed from this page. 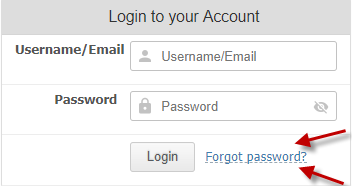 Use the “Login” feature at the top of the website. The credentials for this portal should be the same credentials you use to access your platform. You can reference your activation email in case you forgot them. If you have any other questions about Ironbeam, email your broker at Stage 5. Why are the charts on my S5 Trader greyed out? Why are my charts not working? Most likely you do not have an updated chart plug in. You can download this manually. First close the S5 Trader and then download the Chart/Custom Indicator Package using these instructions. Simply install the plug in for either Live or Demo (whichever platform you are having issues with) and then start the S5 Trader again. You should now have charts. If you do not, then please reinstall the S5 Trader as a whole. Chart/Custom Indicator Package Live: Click Here! Chart/Custom Indicator Package Demo: Click Here! Why does the S5 Trader say it cannot find the, “OEC Chart Package Plugin.exe” or “OEC Excel Add-in” or any other type of plug in? Sometimes the install file does not properly download the plug-in’s needed to work the S5 Trader. If you receive any error messages about the S5 Trader not being able to find a specific plug in, you can download it manually following these instructions. Then continue with the regular install per normal. Excel Add-in Live: Click Here! Excel Add-in Demo: Click Here! Why does my S5 Trader say an, “Internet Connection is required” when I have internet? This is an error from running an S5 Trader with architecture from before December 2017. You must download and re-install a fresh version of the S5 Trader using these instructions. You can only run the S5 Trader on Windows 7 or higher. Where can I find videos about the S5 Trader? Click here for videos about S5 Trader. Why does the S5 Trader say, “Data feed is not entitled” when I pull up a Eurex product despite having paid for Eurex data? Due to interpretations to the Deutsche Boerse AG market data distribution license, as of August 15th, 2016 Eurex products are no longer available through the S5 Trader. It was possible to keep the products within the S5 Trader, but to do so there would have been additional charges. To circumvent these charges, we negotiated the ability to use the GAIN Capital Trader software for traders wishing to continue to receive access to Eurex products. The S5 Trader can still be used for all other exchange’s and products. The GAIN Capital Trader and S5 Trader are both the same white labeled platform. The only difference is that the GAIN platform allows us to bypass the Eurex fees and has a different logo. If you wish to access Eurex products the only action required on your side is to install and use the Gain Capital Trader software. Both the S5 Trader and the GAIN Capital Trader can be installed on the same PC and are essentially the same platform. 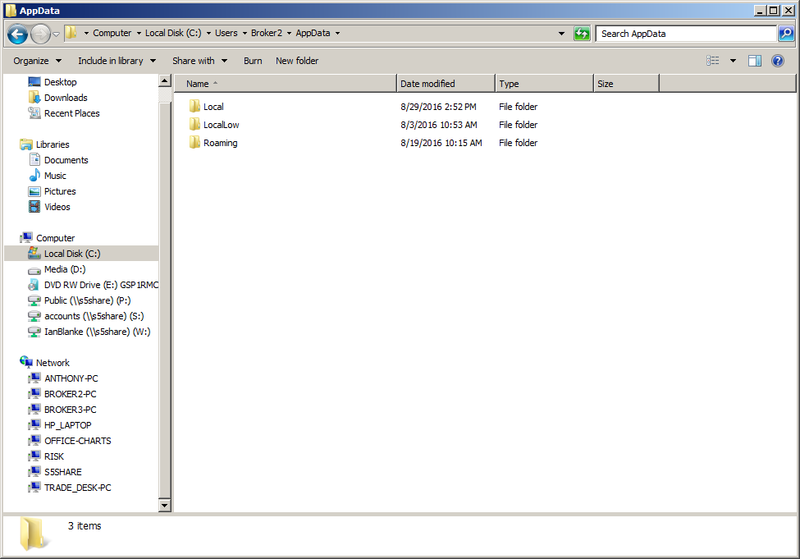 Save your current workspace to a file location you can easily access. Open Gain Capital Trader & Login with your live S5 Trader login credentials. 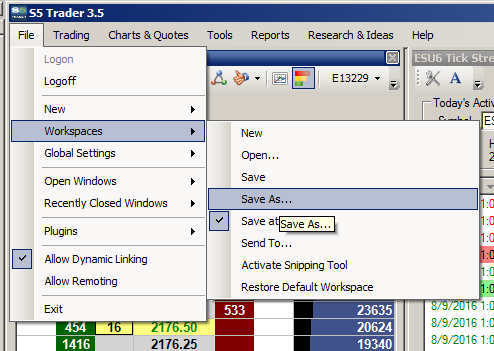 Save at Close *** This is a setting we recommend checking so that future changes are saved automatically when you log out. Why does the connection to my platform keep dropping? Shut down both the platform and your PC and try reconnecting. Ensure that there is no on-going issue with your ISP. Ensure that you are running on a hard-wired connection and not wifi. It is not recommended to trade with a wifi connection per the explanation above. Run your platform with any firewall or anti-virus installed on your computer disabled. Run a ping test with the following instructions. You will have to run this test often to establish a “base-line” ping during periods when you do not have a problem. If you start having a bad connection, run the ping test and compare your current ping to your baseline. If it is significantly higher, than there is something going on with your internet connection. Run a Telnet test to test your internet connection using the following instructions. Why does my Bookmap look different from the S5 Bookmap? Stage 5 has a special version of Bookmap that offers a theoretical average indicator. If you are a Stage 5 Customer and use Bookmap, you should be using this version as it has an additional feature with no additional charge. Typically, you can download this from your Bookmap Portal. If you are not able to do this, you will have to email support@veloxpro.com and request they enable your Bookmap license for S5 Bookmap. How do I install .NET framework 3.5? 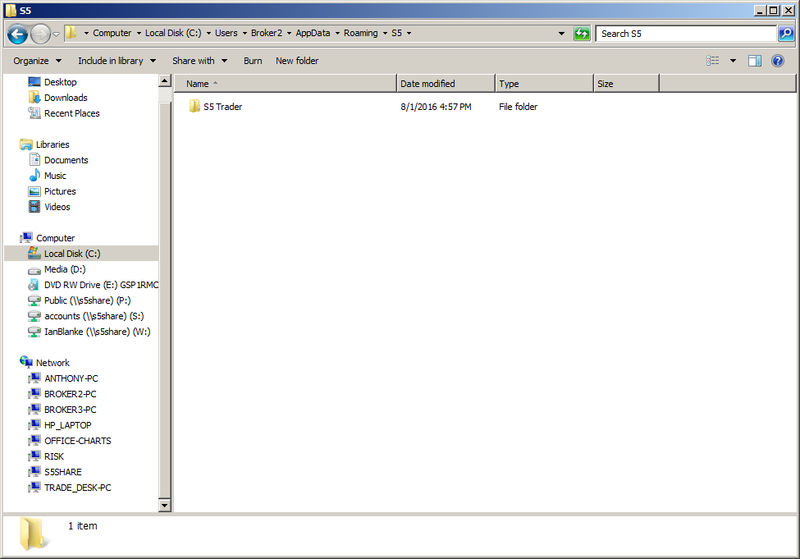 Some trading platforms require .NET framework 3.5 to work. 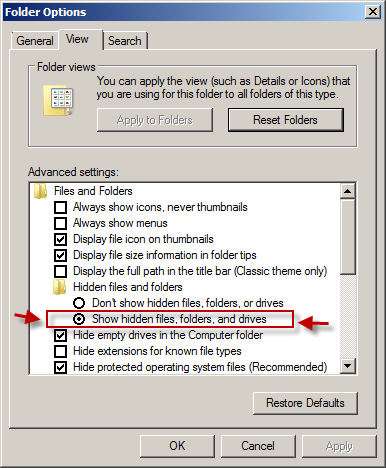 Operating Systems Windows 8 and above require this to be manually enabled with the following instructions: Click Here! Why does it say that my chart/DOM/subscription limit has been reached? Gain Capital places a default limit of 5 charts, 5 DOMs, and 50 symbols per user. Stage 5 has a special relationship with Gain that allows us to provide 10 charts, 10 DOMs, and 50 symbols. If you attempt to go over this you should receive an error message. In our opinion, having this many charts/DOMs open causes the platform to slow down regardless of system specifications. A better solution is to only open a few charts/DOMs and use the Link to Quotes feature toggle between products. Why does it say my max order quantity is 0 when I try to trade? This means your account has been locked, either by your specific request or because you violated a risk limit and the risk desk locked your account. If this is the case, please email your broker at Stage 5 Trading to get unlocked and continue trading. How do I fix a corrupted work space? If the S5 Trader is giving you persistent trouble with something, you may have a corrupted workspace. This means we will need to delete any hidden files that are located in the S5 Trader. The bad news is all your workspaces will be deleted and you will need to re-create them. The good news is the process of how to delete these files is fairly short. The process is very similar for Windows 10 and and be followed with the same steps. 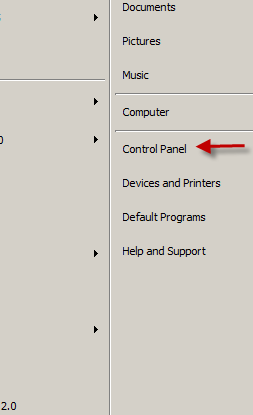 From here, we will need to remove program from the Windows Control Panel in Add/Remove Programs. From here, there are two folder options. You will need to delete the Trader.xml file. They could be located in one of these folders. Typically, they will be located in the “Local,” “Roaming,” or both of these folders. Once you select one of these folders, you will want to open up the S5 Trader folder. This folder will be named S5 or S5 Trader. Where can I find help with 3rd party platforms? Stage 5 should be able to assist you with connecting your brokerage account to any 3rd party platforms we have available. We may also be able to assist you with general information about the specific platform. However, more detailed inquires will require you to reach out to the support team of the particular platform you are using. The below is a list of resources for assistance with various 3rd party platforms. Bookmap resources can be found within your Bookmap Portal. Their YouTube channel also has a extensive knowledge base that includes platform walkthroughs, webinars, and specific feature explanations: Click Here! Information on Jigsaw Daytradr can found on their FAQ along with additional information on their YouTube Channel. The R Trader user guide can be found here. How do I get 6E to format prices properly when using S5 Trader and DTNMA? To recap, you should have the DTN Symbol set up as @EU#*100 and the Display format set to 99.99. This will display your historical data the same way that Stage 5 is feeding your real time data.